Buy Online Now! 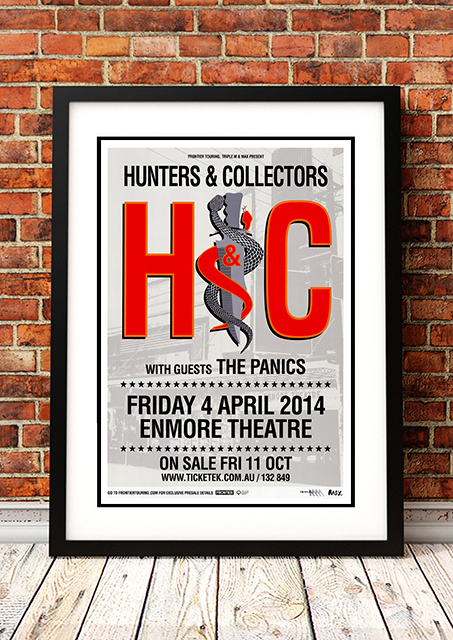 – Classic Hunters and Collectors Concert Posters and Memorabilia. Hunters and Collectors made their live debut on the 15th of May 1981 at the Seaview Ballroom in Melbourne. Hunters and Collectors quickly earned a reputation as the ‘next big thing’ and the band to experience live through chaotic, intense live performances. They were signed up by Mushroom Records label White, which they remained with for the entire of their existence. The January 1982 released debut EP “World Of Stone” (World Of Stone / Watcher / Loinclothing) gave the Hunna’s an early taste of success, spending eight weeks in the Australian top 100, peaking at number 50. The self titled debut studio album came out in mid 1982, selling reasonably well in Australia (#14, eventually selling Gold) and in New Zealand. 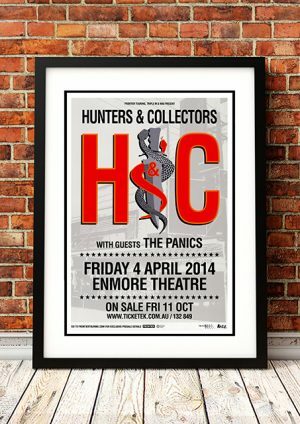 We stock an awesome Hunters and Collectors Print.